Artists supporting the non-profit organization include Tim McGraw, Faith Hill, Keith Urban, John Rich, Lady Antebellum, Miley Cyrus, Darryl Worley, Rodney Atkins and many others. 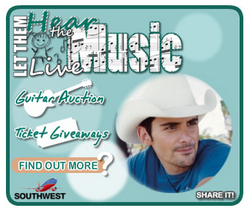 Hear The Music Live a non-profit organization that provides teen and pre-teens in foster care with the opportunity to attend live concert events, has announced a CMA Awards flyaway trip promotion. One chosen winner and a guest will receive round trip airfare to Nashville from any Southwest Airlines destination, two tickets to the 2010 CMA Awards, hotel accommodations and meals. Radio and television stations as well as other media outlets may participate in this promotion by placing the official contest widget on their websites and social profiles. The widget includes more information on Hear The Music Live and also the “enter to win” contesting registration (pictured below). Click HERE to access the widget seed page; the embed code and links to place the app on your Facebook or MySpace profile are included in the widget under the "Share It" link. Hear The Music Live’s primary focus is to reach out to pre-teens and teens in residential treatment foster care group homes to give them the opportunity to attend a concert in their local area (e.g. 90% of the children that Hear The Music Live sends to concerts have never been to a live concert). These children homes provide quality residential treatment programs for abused and neglected children and adolescents. Hear The Music Live was founded by Steven Nornhold in the summer of 2009. To date, Hear The Music Live has sent over 2000 pre-teens and teens from residential foster care group homes to see live concerts and meet music performers throughout the U.S. During 2009 and 2010, Hear The Music Live obtained substantial support from country music artists. Katie Armiger recorded the theme song for Hear The Music Live, which is featured on CDX 509. Also on that CDX volume are audio PSA’s recorded by Katie Armiger, Rodney Atkins and Jimmy Wayne, and Darryl Worley. For further information contact Hear the Music Live. You can also email Steven Nornhold at steven_nornhold at hearthemusiclive dot org or Aimee White at aimee_white at hearthemusiclive dot org.